People who say that you should never take your car to the dealership because it’s more expensive need to understand just what they’re paying for with that extra cash! 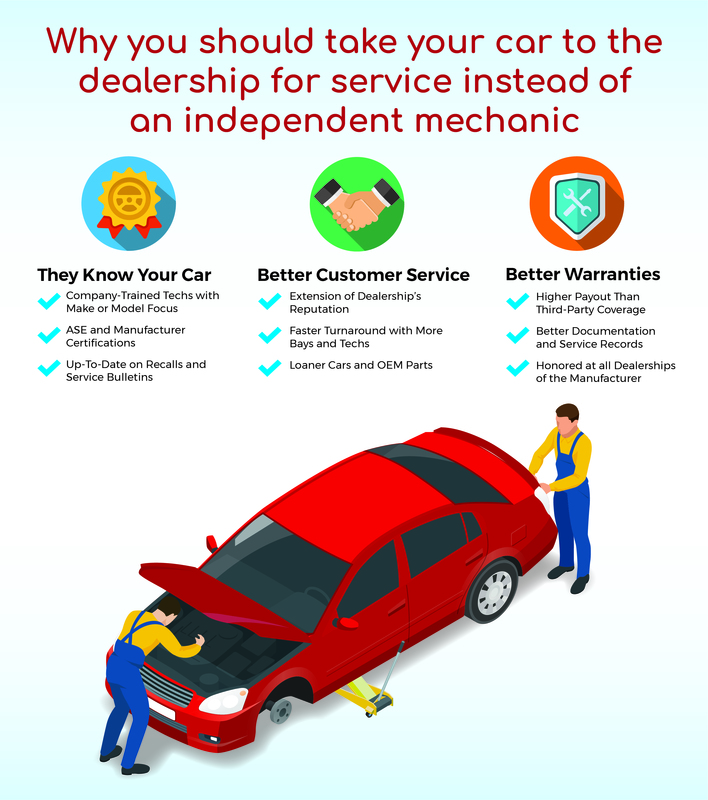 There are a lot of advantages to using a dealership’s service center to repair your car than an independent mechanic. Here are a few reasons why. Dealerships use company-trained technicians who focus on a single make of vehicle. These technicians are often ASE certified and have manufacturer certifications on top of this. They may even have to take continuing education classes. In short, they get all the information and parts they need to work on your car right the first time. In many independent shops, they don’t have this training or it’s out of date. You may be paying less, but the technician probably knows less and may not know how to do the job right. They may take shortcuts that could cause problems down the road because they don’t know all of the ins and outs of your vehicle. Dealerships are also the first to know about recalls and technical service bulletins about your vehicle. Taking in a vehicle to a dealer for regular maintenance will help you avoid hidden problems that could cause a major crash. And due to their extensive training, if you have an obscure problem they often can look it up so there’s no guesswork. Dealerships are extensions of an auto manufacturer’s corporate ethos. A service center that doesn’t meet standards could get shut down. That’s why dealerships are often cleaner, have more waiting room perks, and have the latest tools and equipment for service. Also, dealerships are often faster. Not only are there often more bays and technicians, but they also have more loaner cars. If your car has a serious issue that requires multiple days, it’s much easier to get a loaner car at a dealership. This can save you the cost of an expensive rental. Dealerships also have OEM parts in stock, so if you have to use a loaner it’s not usually because you’re waiting on a part shipment. Dealership warranties are the best you’ll find in the business. Third-party warranties have one goal – to pay out as little as possible. But dealerships have a reputation to uphold so they will pay much more readily than third-party warranties. Also, because they have better warranties and documentation practices, it’s best to take your car to a dealership after a crash whether you have a warranty or not. If you regularly take your car to the dealer they can pull up the entire service record and give your attorney information that can help you get the amount of compensation you need. These are just some of the reasons why it’s better to go to the dealership than to an independent shop. Nevertheless, if you break down away from the dealership you may have to use one. If so, look for one that has both ASE certification and specific certification in your make. And if you can find a dealership, they may be able to pull the records from your main dealership so they can better service your vehicle.